Hearthstone’s Boomsday Project expansion has been live for two months now, and as tends to happen at the end of the expansion cycle, the game is beginning to feel like a waiting room for the 4 December launch of the next set, Rastakhan’s Rumble. Iterations of Hearthstone’s most powerful decks have reigned for months, and while nerfs and a couple new decks have managed to help shake things up, ranked play is relatively stagnant. Still, that doesn’t mean there aren’t ways to break out of the late-expansion slump. Star Aligner Pocket Galaxy Mage is a deck configuration that requires you to play a 7-cost spell that makes all the minions in your deck cost 1 mana. Then you have to actually draw those minions, and then you have to play three minions with 7 health in order to trigger the effect of a card appropriately called the “Star Aligner,” which then deals 7 damage to your opponent and all their minions. It’s a rare, powerful effect, and can only really work in the context of a ridiculous deck like this one. It’s not the sort of thing Kibler would usually do, but in the pre-update doldrums, any changeup is welcome. 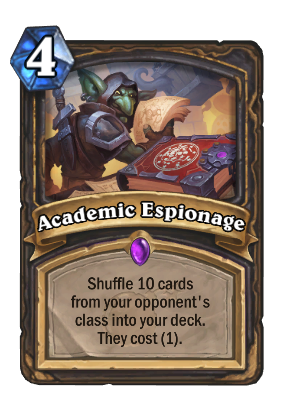 Cora “Songbird” Georgiou, another commentator and streamer I spoke with at HCT Fall, said she has been playing the not-great-but-still-fun “Academic Espionage Rogue,” a deck that uses a 4-mana card called Academic Espionage to shuffle 10 cards from your opponent’s class into your deck. Since any cards added to your deck this way have their costs reduced to 1, it opens up some powerful possibilities if you can survive for long enough to draw them. “[I’ve been] having a lot of fun with that, because fundamentally every game is going to be very different, so there’s a lot of exciting things that can happen there,” Georgiou said. Some players, like James “Firebat” Kosetich, see the late-expansion slowdown as an opportunity to build irreverent twists on old decks. In a recent series of streams, Firebat and Paul “Zalae” Nemeth stitched together a series of makeshift Druid decks just for fun. Since the class’ cards are mostly top-tier in the current metagame, the concept was that they could run a bunch of high-quality Druid cards and still win regardless of what late-game win conditions they tossed into the deck. 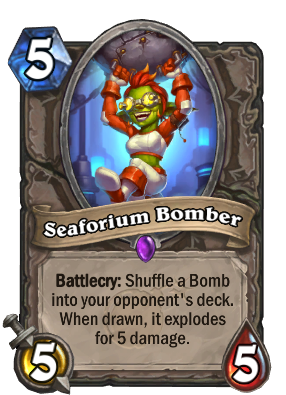 One such deck revolved around Seaforium Bomber, a 5-mana 5/5 minion that puts a Bomb card into the opponent’s deck that, when drawn, deals 5 damage to the opponent. They’d survive until the late game, play their Bombers, and hope that the opponent died by drawing the bombs. This was a cheeky move on their part, because decks in Hearthstone are supposed to involve synergy and sacrifice. If you want to build a deck that kills the opponent in the early game, you typically have to fill it with early-game tools and give up the ability to come back in the late game. If you want to make a deck that wins in the late game, you give up your ability to make powerful early moves. In Druid, though, if you make a deck with the class’ best cards, you can practically ensure your survival to late game, where you can pull off whatever winning combos you want. While the Zalae/Firebat deck experiments were basically an inside joke about the Druid class’ raw power, the stream led to some hilarious, unexpected moments. Hoping the opponent draws the bomb you gave them isn’t a great strategy, but it’s a hell of a way to end a game..